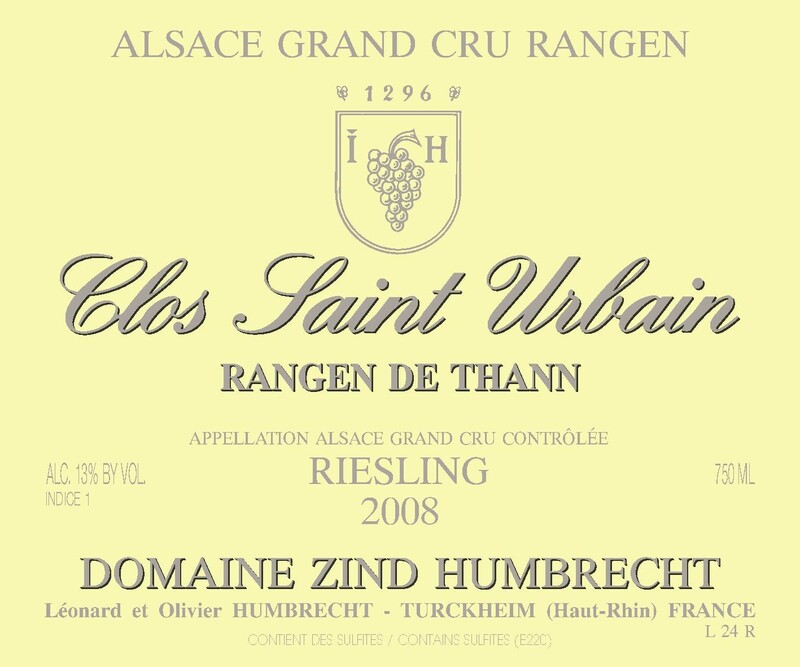 The Rangen Grand Cru is located at the south end of Alsace, higher in altitude (350m to 450m) and enjoys a cooler late ripening climate. The soil is really the key to understand this vineyard. Made of Sedimentary Volcanic material, it is very rich in minerals, can produce small amounts of high quality clay, is poor in organic matter and covered with large chunks of irregular dark coloured rocks, on an ultra steep (100%) South facing hillside. The Clos Saint Urbain is a 5.5ha vineyard that my father, Leonard, regrouped around the small St Urbain chapel, located in the part of the Rangen that is directly above the small river Thur. Cultivating this vineyard is tough, but the results are worth it. No other vineyard is capable of influencing the personality of wine like the Rangen. In 2008, the grapes managed to ripen to perfection and stayed very healthy, despite the late harvest. The wine fermented very slowly, but like often with Rangen, right to the end. It spent also its 18 months in foudre on the fermenting lees. (Never racked!). 2/2010: if I would say that this wine had powdered volcanic rocks macerating in the cask, I am sure everybody would believe me after nosing this wine. There are so many minerals, flint stone aromas, but also spices and smoky flavours on the nose. The palate is dry, intense, and very long and finishes on a salty iodine complex mouth. It appears even more mineral than the 2007, but I am happy to bet that this wine will be just as fruity and explosive in a year or two. Definitely one of my ‘coup de Coeur’ in 2008.